Frederick’s father was one of several James Bucklands, so for clarity is labelled here James No 2. He was baptised in 1862 in All Saints Church, Little Bookham, just over the hill from the western end of Ranmore Common. He was the son of another James Buckland (No 1) and his wife Lydia nee Bishop, born in Effingham. When she married James No 1 in 1853 in All Saints, Little Bookham, Lydia’s address was Clerkenwell, London (probably in service there). Lydia and James No 1 had at least five daughters as well as their son James (No 2). She died in 1879, the St Barnabas School logbook stating that her daughter Eliza was “fetched home today at noon because of the death of her mother”. Lydia was taken back to Little Bookham for burial with other members of the Bishop and Buckland families. In 1881 Frederick’s father James No 2 was boarding at Ranmore Dairy (probably Dairy Cottages, see Sketch Map) and working as a cowman. His “landlord” was the former cowman Henry Porter from Bodiam, Kent (a connection through the marriage of Mary, Thomas Cubitt’s daughter, to Charles Parker, its vicar). On 3rd December 1887, Fred Buckland’s father James No 2, labourer, married Annie Adelaide Overton in St Barnabas Church. The Overtons were a prolific family, but Annie Adelaide appears to have produced only three children: Jessie Ethel, Frederick Sydney and James (No 3). All three were baptised at St Barnabas and attended its adjacent School. 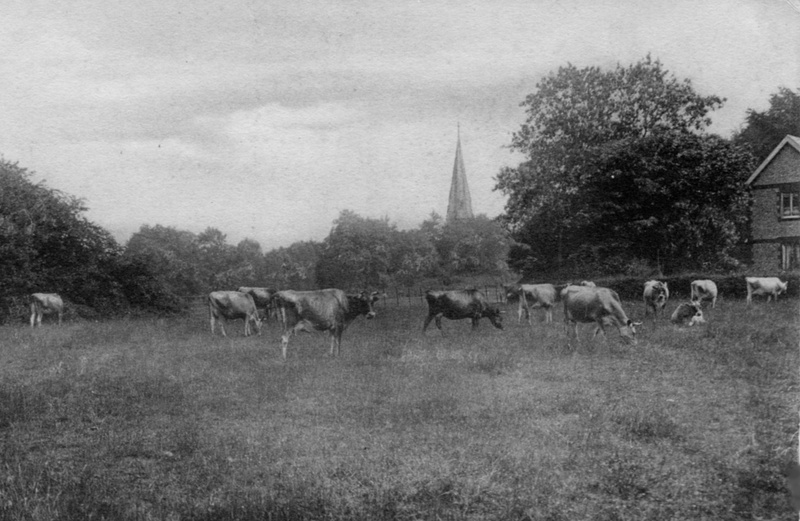 In the 1891 and 1901 censuses James No 2 was a “stockman” on a farm and the Bucklands had moved to the western end of the Common, adjacent to many members of Annie’s family. They lived variously in one of the several Garlic Cottages (see picture below), for many years in Stoney Rock Cottages, and finally at Ranmore Farm (see Sketch Map for where these houses are). In his later years James No 2 was once again described as farm labourer. He is probably the “Mr J Buckland” on the Golden Wedding Anniversary scroll to Lord and Lady Ashcombe in 1903, but on the scroll there is also a Mr C Buckland, whose identity is unknown, although, according to the school logbook, there was another family of Bucklands living on Ranmore. 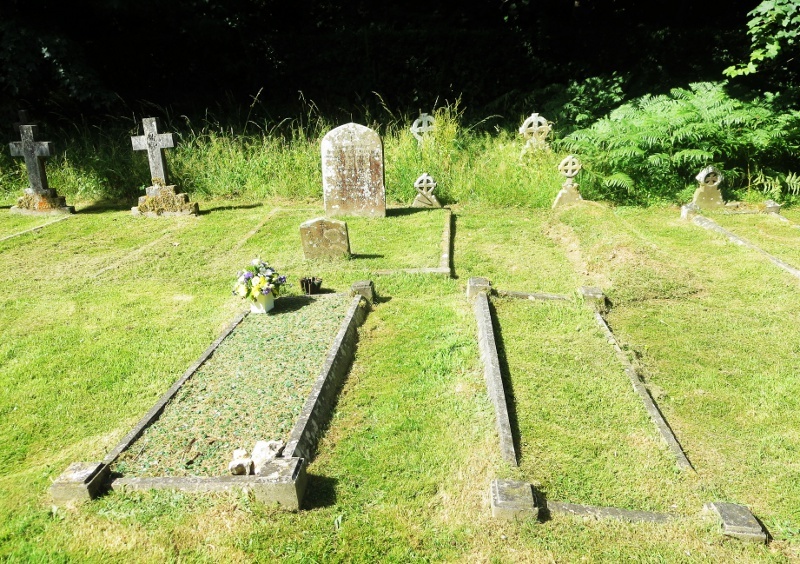 Both James No 2 and Annie Adelaide were buried in St Barnabas churchyard in the same grave (D15), Annie on 7th October 1941, James on 25th May 1950. The Buckland and Overton graves to the right of the path from the lych gate at St Barnabas. James senior (No 2) and Annie Adelaide Buckland are buried in the grave to the right (D15); their son James (No 3) and his wife Margaret Annie in the grave with the flowers (D14); and in the distance, right at the back among the longer grass with matching Celtic cross headstones, are Annie Adelaide’s parents Ann(e) and Thomas Overton (B14 and 15). Garlic Cottages today No 1, on the left, usually seems to have been the Estate blacksmith’s house. 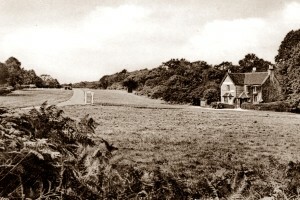 In 1891 the right hand cottage was the home of Annie Adelaide and James (No 2) Buckland. 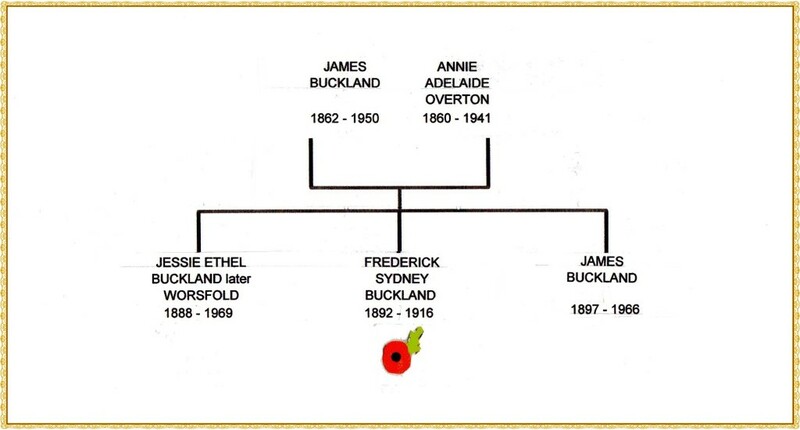 In 1891 when Annie Adelaide married James Buckland (No 2), a cluster of Overtons lived nearby. The parents Thomas and Anne were at Ranmore Farm; an older son William James (agricultural labourer) was at nearby Bakehouse Cottage (see Sketch Map), and younger son Jesse, the blacksmith, lived in one half of Garlic Cottages. The other half of the cottages was occupied by Annie Adelaide and James Buckland No 2. Annie Adelaide is probably the “Mrs Buckland” who served in Lady Ashcombe’s Needlework Working Party during World War One as a VAD (Voluntary Aid Detachment). 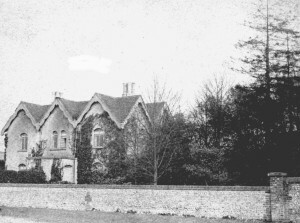 Jessie Ethel (1888) and James (1897), the surviving Buckland offspring, stayed in and around Ranmore and Dorking all their lives. Jessie Ethel, the oldest child, was born 26th September 1888 and baptised at St Barnabas on 14th November. She started at the School in April 1894. There is only one mention of her in the school logbook: in 1901 she gained a religious knowledge certificate as a result of the regular Diocesan Inspection. It is not certain what she did after she left school on 19th December 1902, until, on 25th June 1910, she married a carter, Walter William Worsfold. 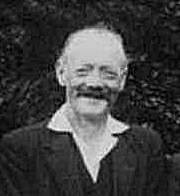 Born and baptised 1883 at Ewhurst, Surrey, Walter William was the son of Jesse, another carter, who later moved to Ranmore and who may be the J. Worsfold in the 1934 picture of “Men with 20 years’ Service” on the Denbies Estate. A year after their marriage Jessie and Walter Worsfold were living on Ranmore (with a nine-year-old visitor William Overton Benham). Walter is believed to have served in WW1, but no records have been found. He is probably the W. Worsfold in the 1934 photo of men with 20 years’ service on the Estate mentioned above. He died the following year aged 52, and was buried at St Barnabas on 30th April (grave L8). 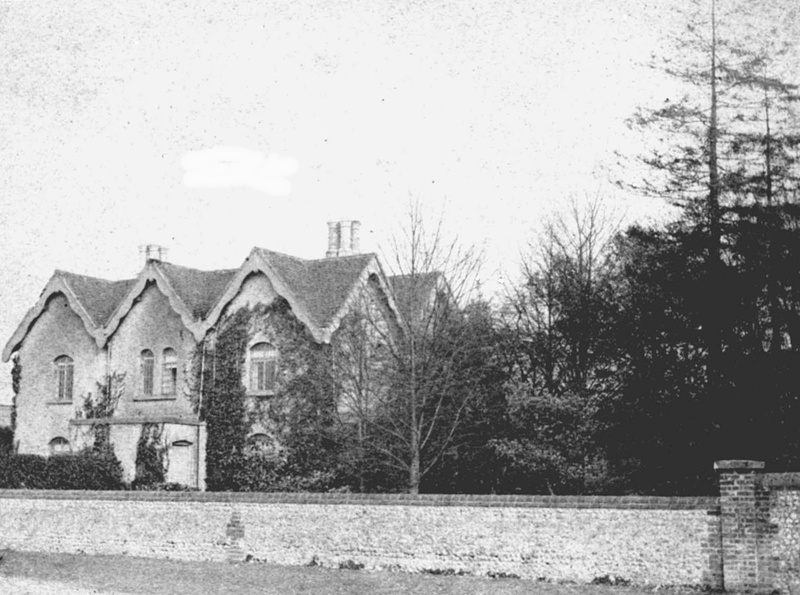 His wife Jessie Ethel lived on for another 30 years, ending up at North Holmwood. She too was buried in St Barnabas churchyard on 29th May, 1969 aged 80 (? grave L10). Frederick of the War Memorial fits in here in the family order, the middle Buckland child, born and baptised 1892 and dying during the lst day of the Battle of the Somme (1st July, 1916) . See his page for more details of his life and death. James (No 3), the youngest Buckland child, was born 28th July 1897 and baptised at St Barnabas on 8th October. He started at St Barnabas School in April 1904, but does not feature in the school logbooks until he left “to go to work” on 29th April 1912. According to his daughter Muriel Rice, he went to France with The Queen’s (Royal West Surrey Regiment) during WW1 and he is wearing medal ribbons in the Denbies Home Guard photograph. James Buckland No 3, labourer, married Margaret Annie Ledger at St Martin’s Dorking on 15th October 1925. Margaret Annie was born in 1895 and her father Arthur Ledger was a railway carrier. 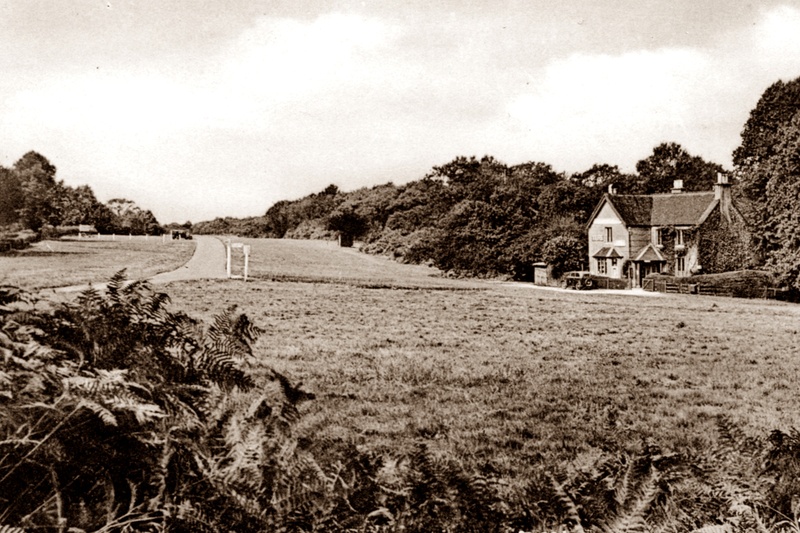 By 1927, when their daughter Muriel was baptised at St Barnabas, James No 3 had become a stockman like his father, and the family were living at Golden Ring Cottage, on the western end of the Common. Later, the family lived in Stoney Rock Cottages and Jim managed the Ranmore Farm herd. 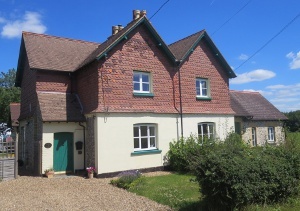 In 1959 he moved to No 2 Dairy Cottages, at the eastern end of the Common, convenient for the dairy yard and for managing the Denbies dairy herd. (See the Sketch Map for all these places.) James No 3 died on 17th June 1966 and was buried at St Barnabas in grave D14. Margaret Annie lived on at Dairy Cottages another four years when she was buried on 20th June 1970 in the same grave. During WW2 James and Margaret’s daughter Muriel worked at Ranmore Post Office under Mr Carne. She subsequently married Sydney Hector Rice (apparently no relation to Nathaniel of the War Memorial). Muriel and Sydney had five children (Barry, Derek, Carol, Patricia and Alison). After Sydney’s death in 2013, his ashes were interred in St Barnabas churchyard. This is a composite list of the sources consulted for all members of Frederick Buckland’s family, but details for the individual family members are available if required. Virtually all of the sources mentioned can be viewed online via Ancestry, Find My Past and Free BMD.